The majority of compensation claims assessed in the first six months of this year were whiplash related. THERE HAVE BEEN calls today for legislation on whiplash costs as new figures reveal the average award in these cases is over €20,000. Data provided by the Personal Injuries Assessment Board (PIAB) for the first six months of this year reveals that the average award for a whiplash case was €18,581 in general damages (pain and suffering) with a further €1,456 in special damages which covers payment for medical expenses and loss of earnings. The board is the independent State body which assesses personal injury claims and compensation. 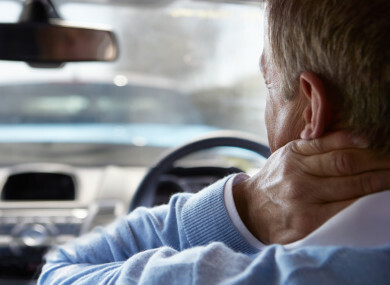 In the first half of the year, there were 4,500 awards made by the board and 70.8% of all personal injury motor cases assessed were whiplash related. The average award for women in these cases is slightly above average – €19,066 in general damages and €1734 in special damages. For a passenger the average is €17,026 in general damages and €857 in special damages. The data shows overall motor awards in numbers are split almost 50/50 between males and females. In 88% of whiplash cases, the claimant received an award of under €30,000. When it comes to other injuries which did not involve whiplash, the average total award was higher at €27,386. This is likely to be because those injuries involved fractures or more serious injuries. In September, the Personal Injuries Commission (PIC) said the average Irish soft tissue award was €17,338, 4.4 times the UK average. Insurance Ireland CEO Kevin Thompson said these figures highlight the “urgent need” for a legislative response to whiplash costs. “We have an agreed course of action for the Judicial Council, when established, to produce guidelines on appropriate levels of compensation in Ireland similar to what exists in England, Wales, and Northern Ireland. “What is needed now is a timeline for the Judicial Council Bill so the opportunity for reform of high whiplash costs is not missed and we deliver a sustainable and predictable personal injury compensation system,” he said. Email “Personal injury claims: Average award in whiplash cases is over €20,000 ”. Feedback on “Personal injury claims: Average award in whiplash cases is over €20,000 ”.